Before leaving for his Winter Break, founding director of marching and athletic bands Dr. Chester Phillips received a once-in-a-lifetime phone call. Phillips learned that his three-year old Georgia State marching band was selected to perform in President Barack Obama’s second Inaugural Parade. The band was one of the 24 groups selected out of more than 2,800 applicants and the only group from Georgia to go. The Student Activity Fee Committee approved the band’s travel budget on Nov. 9 for a total of $120,436. A total of $32,635 covers transportation, $54,484 for housing, $32,035 for meals and 1,282 for site-visits. Having their travel expenses covered allowed some band members to march their way into history without any hesitation. “Because it’s paid for already, the decision to go was automatic,” said band member and sousaphone player Bre Herrington. Herrington, like other Georgia State marching band members, is humble and excited about their historical accomplishment. “I feel honored and privileged. I have an opportunity to represent Georgia State as well as the state of Georgia,” Herrington said, who’s been with the band since its launch. The Georgia State Marching Band will depart from Atlanta on Jan. 18, arrive that night, site-see on Saturday and Sunday and perform in the 57th Presidential Inaugural Parade on Jan. 21 at 2:30p.m. 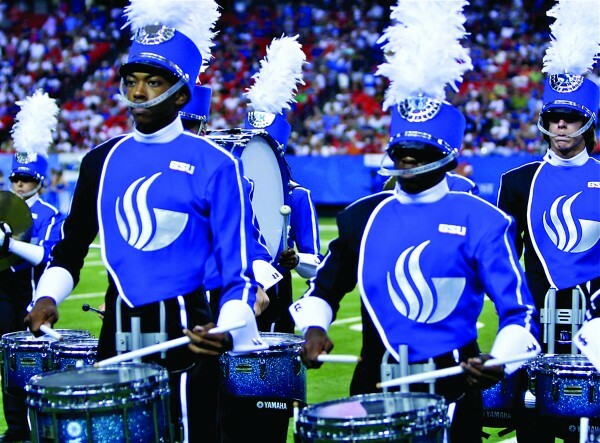 For other students, Georgia State marching band’s astonishing success has roused their school spirit. “Georgia State is finally getting some love. This helps to give the school more national attention. Could have chosen any school in the country, but chose us,” said sophomore and biology major Onyebuchi Imonugo. Its decision to apply was determined at the start of its journey. “We decided to apply to be in the parade a long time ago. It’s been in our strategic plan since we founded the band,” Dr. Phillips said. Band members did not know about the application at first. “We wanted to keep it a surprise so when we were accepted it would be a big reveal,” Phillips said. Georgia State 2012 Homecoming King Kyle Walcott said that Georgia State is one of Atlanta’s brightest places. “It truly makes a student beyond proud to attend an institution that works tirelessly to make history,” Walcott said. The band will perform James Brown’s “Living in America” in the parade.